Posted March 9, 2017 by Terra & filed under Roofing. Even though spring brings with it higher temperatures, the rising mercury could lead to problems with your home. 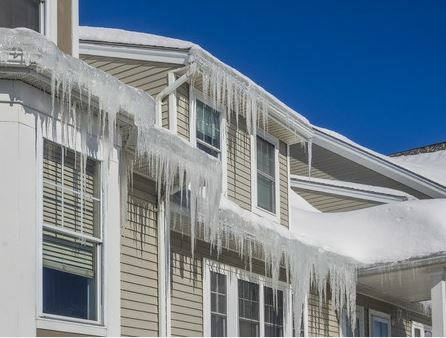 One issue, in particular, that could cause quite a bit of damage is ice dams, which can form on the roof of your home or business. As you already know, snow accumulates on the roof all throughout the winter. Once spring starts to roll in, the rising temperatures cause all of that snow to start to melt. Unfortunately, the temperatures don’t tend to stay high consistently, and often will drop down to below freezing once night falls. This causes whatever liquid has formed during the day to refreeze at night in the gutters and on the lower edge of the roof. This can create ice blockages that prevent moisture from draining properly and that build up over time, adding weight and potentially damaging your building or its gutters. If not addressed, ice dams can wreak havoc in numerous ways. For starters, the moisture can freeze beneath shingles or along weak seams, leading its way into the decking of your roof and causing it to rot or causing moisture damage to your roofing or insulation. Also, when water turns to ice, it expands. This means that if water cannot drain, these ice dams can build and grow, increasing the potential that gutters can pull away from the roof, damaging both fixtures in the process. Now the average homeowner may not be sure where to look and what to do to prevent these dams from forming. That’s where a professional home inspector comes in. They will be able to notice if the roofing and gutters of your homes don’t look like they should and need some attention. For example, if the roofing looks uneven right around the gutter, that could be a sign that an ice dam and its moisture has already found its way into the roofing of the building before, and even potentially the walls. It’s a sure sign that your roof needs some professional attention. An inspector can also note the condition of gutters and see if they are drooping or clogged, both of which can be signs that they aren’t working as they should and that ice and moisture is weighing heavy on the gutter, pulling it away from the sides of the structure. This spring, make sure that your roof and drainage systems are working the way they should to keep your roof in good condition and move moisture away from your property. Whether your property needs an inspection to gauge signs of ice dam damage or you want to assess the inside and outside of your property to check for any hidden issues, our comprehensive inspections review your building from foundation to roof. Call the professionals at Accurate Home Inspections to come out and take a look at your property. Schedule an appointment today by calling 403-826-6111!